North Norfolk Beach Runners were scattered to several points of the compass at the weekend. Closest to home were the Magnificent Seven who tackled the Marriott’s Way 10k between Aylsham and Reepham, the most magnificent among whom was SuperSeventy Sam Weller. Competing in the M60+ category despite his advancing years – and because yet again that was the highest age category – he was the first Beach Runner home, running 46.28 for 27th out of 404 finishers and 3rd in category, having probably conceded a few years to the two in front of him. Following on came Lisa Stickells (FO) in 51.51 for 140th and 10th in category out of 102; Helen Hagon, (F55-59) in 53.07, 157th and 2nd out of 13; Richard West (M45-49), in 55.47, 207th and 26th; Heather Morton (F50-54), 59.20, 280th and 6th; Linda Melton, (F55-59), 1.02.16 for 315th and 9th; and Karen West (F55-59), 1.06.28 for 351st and 11th. Out east, at the Lowestoft Half Marathon, Fish Sadler (V55) grabbed 32nd place out of 411 finishers and 2nd in category with a time of 1.30.31. Two other Beach Runners were there, Becky Garratt (V40 W) running 1.53.10 for 158th and 5th; and Deborah Gillespie (V50 W) in 2.25.45 for 367th and 10th. Down south in Carrot Cruncher country, four Beach Runners were seen running the Flower of Suffolk Marathon from Walberswick which took in such Cruncher eccentricities as trotting Dunwich Greyfriars Priory, dodging coastal erosion and negotiating the seasonal deer rut on Dunwich Heath. No results had been seen at the time of going to press but neither had Anita Bullen, Chris Gibbons, Kirk Price and Colin Stark. Nuff said. Meanwhile well out west, Beck Maun (F45-49) ran the Oxford Half Marathon along with around 8500 others and posted a pb of 1.39.32 for 1372nd overall but 8th out of several hundred in category. And even further out west, Neil Adams (V40) did the Plymouth 10k in 36.08 for 14th out of 1298 and 2nd in category. But this week’s award for farthest flung Beach Runner goes to Nathan Bayle (M16-39) who ran the Aroraki-Mount Cook 21km on South Island, New Zealand in 1.36.21 for 27th out of 226 runners and 20th in category. But then he’s been kicking around down there for a while and is just showing off, really. FUN, FUNDS AND LAST OF THE SUMMER WINE. Sixteen North Norfolk Beach Runners were among the 299 who had fun on the Bure Valley 10 Mile around the still leafy lanes north of Banningham and east of the A140 on Sunday. The race, organised by Bure Valley Harriers on a scenic and convoluted route through bow-and-arrer country where traffic rarely ventures, was won by Kevin Holland (M40-44) of Wymondham AC in 55.28.4, but two Beach Runners were in the top 10 – Chris Merrylees (M40-44) in 7th with a time of 59.42 for 3rd in category, followed by Neil Adams (M40-44) in 59.53 for 8th and 4th. Darren Armstrong (M40-44) was also in the mix with 1.04.28 for 24th and 10th. And as the race winner and runner-up were also M40-44s but can only get one prize each, Chris M got the vet’s prize with Neil A second, the two of them with Darren A getting the vets’ team prize. It’s good to keep the old boys happy. First lady Beach Runner was Charlotte Neale (FO) in 1.04.41 for 25th overall and 3rd in category, while Super Seventy Sam Weller (M65+) who claimed never to have previously run that far, finished in 1.18.03 for 101st and 2nd . Meanwhile, back at the clubhouse on the previous Thursday, NNBR was able to present another cheque, this one for £2,115.18, to George Burroughs of the Stroke Association, that amount being the fund raising proceeds of this year’s Chase the Train race which NNBR organises in May. 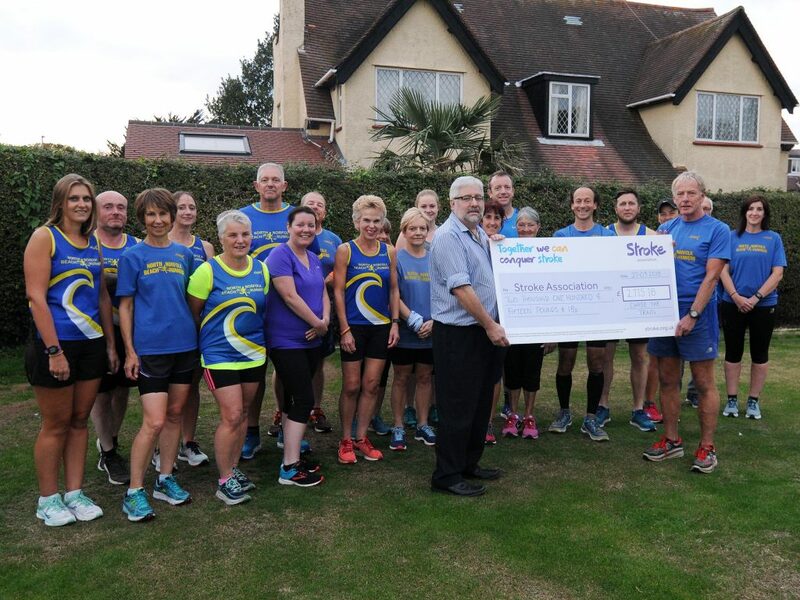 It brings the Club’s total amount raised for the Association this year to £6565.18 which will be further enhanced with donations from the Holt 10k on October 21st. It was a rain-lashed Coltishall runway which hosted 503 runners for the Jolly Jaguars 10k organised by Coltishall Jaguars on Sunday but it wasn’t too wet for some flying North Norfolk Beach Runner performances when a dozen of them got their flaps down and tails up. In a race won by Kevin Holland (M 40-44) of Wymondham AC with a time of 32.50, the first Beach Runner home was Darren Armstrong (M 40-44) in 12th position overall and second in category with a time of 38.43. Following on came Beck Maun (F 45-49) in 43.57 for 94th but 3rd in category, after whom came Super Seventy and increasingly usual suspect Sam Weller (M70-74) in 44.35 in 110th and 1st in category. Finishing order thereafter in the NNBR pack was: Karl Harper (M45-49), 50.26, 206th and 23rd; Alison Lowe (F18-34) 50.28, 207th and 10th; Sophie Saunders (F18-34) 51.10, 222nd and 14th; Vicky Last (F18-34) 52.35, 243rd and 16th; Richard West (M45-49) 54.56, 292nd and 32nd; Vicky Hampson (F18-34) 59.59, 371st and 40th; Karen West (F55-59) 1.06.14, 45st and 6th; Super Seventy Liz Letzer (F70+) 1.06.52. 457th and 1st; and Super Seventy Robin Rush (M75+) 1.09.44, 475th and 1st. Meanwhile, at the Norfolk Coastal Half and Full Marathons, Gemma Woolrych (F45-49) ran the half in 2.09.52 for second in category while Sue Ilsley (F55-59) got third in category for her 2.12.45. In the full, ultra runner Hazel Wray (F50-54) enjoyed a gentle training jog in 4.57.36, but special mention goes to Nancy Crow (F45-49) who completed her first marathon in 5.58.18 which included an entirely intentional solo side track through Holkham dunes to admire the view. North Norfolk’s like that. The big event of the East Anglian club running season, the Timberwolf Round Norfolk Relay, took place over the weekend. This 198-mile course is run clockwise around the county in 17 stages varying from 5.49 to 19.68 miles, starting and finishing in King’s Lynn. First stage runners set off from 5.30 am onwards on Saturday, depending on their team’s predicted course time, the theory being that all teams would finish by 10.00am on Sunday. It is a huge logistical exercise, each runner needing an accompanying cyclist during the day and accompanying vehicle at night, together with transport to and from the start and finish of each stage. There is then marshalling, provided by various Norfolk clubs at each of the changeover points where lashings of cake are available, more particularly at the changeovers marshalled by North Norfolk Beach Runners at Cromer and Mundesley where, at the latter, Sue Simms and the increasingly famous Mundesley Cake Ladies excelled yet again. The 60 participating teams included some from Greater London, the Home Counties and East Midlands, as well as East Anglia from where NNBR entered two teams. The fastest time, 20.43.22, was set by City of Norwich Athletics Club, followed by Ely Runners with 20.53.57, but not far behind was NNBR’s A team in 22.06.49 for third overall and second fastest Norfolk club. Stand-out NNBR individual performances included three stage winners: Charlotte Neale running 1.19.28 on the 10.81 miles stage 5 from Cley to Cromer taking in Beeston Bump; Finlay Swanson, who only recently joined the senior ranks and still runs in short trousers, posting 54.44 over the cake-fuelled 9.24 mile stage 7 from Mundesley to Lessingham, and the star turn and British international Robbie Britten running 1.57.52 over the 19.67 mile night time stage 12 from Scole to Thetford. All concerned had a slow day on Monday. Eight North Norfolk Beach Runners headed west to the edge of the Fens for the Wissey Half Marathon on Sunday 2nd September and spread themselves fairly evenly among the 255 finishers. On a warm sunny day, the first Beach Runner home home was ultra man and member of the 100 marathon club, Vinnie Purdy (M40-44) in 1.25.57 for 14th place but first in category. He was followed by a triumvirate of M60+ Beach Runners: Adrian Dyde in 1.46.30 for 99th overall but 8th out of 20 in category; Derek Sadler in 1.48.32 for 113th overall and 9th, and Jim Hayes, a SuperSeventy-plus-a-few showing the younger lads how it’s done with 1.51.33 for 128th and 10th. Hopefully all races will soon have categorisations which acknowledge that people are running well in their eighth decade. Completing the NNBR contingent were: Keith Phillips (M50-54) in 2.09.41 for 196th and 19th; Nicky Phillips (F50-54) in 2.12.26 for 201st and 7th; Nancy Crow (F45-49) in 2.36.53 for 250thand 18th; and Karen Stubberfield (F50-54) in 3.12.19 for 254th and 14th. 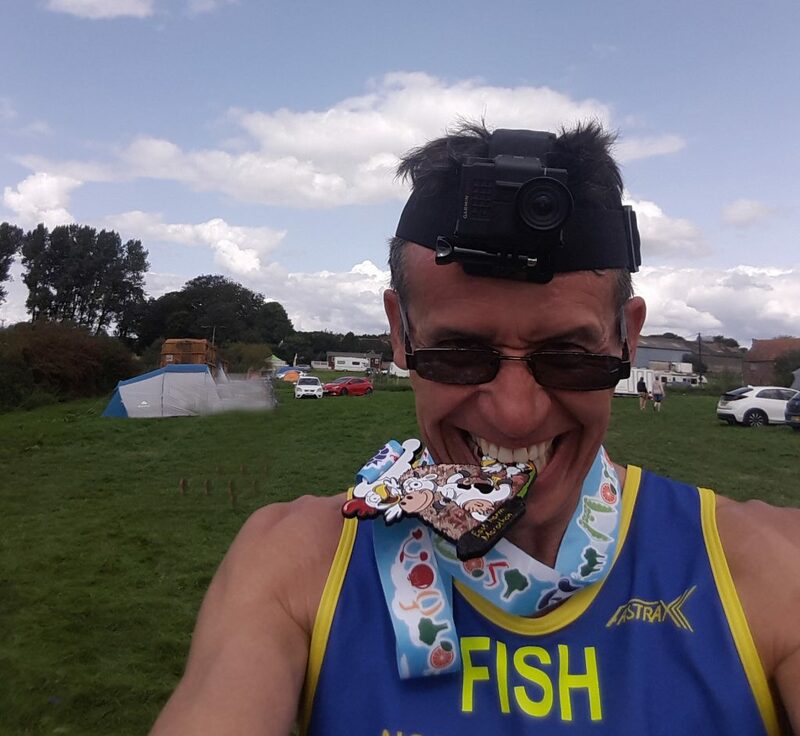 Meanwhile, down on the farm the weekend before, Fish Sadler (M55) went to the East Farm Frolic marathon near Blandford Forum in Dorset and over eight laps of agricultural terrain clocked 3.54.54 for 6th overall out of 128 starters and 1st in category. He also put in the 3rd fastest lap with 25.52. And then, on a higher plane again, Colin Stark took part in the Ultra Trail du Mont Blanc which involves running up Mont Blanc. He covered 170.1km (105 miles) in 36.20.19 and temperatures down to -10C but at the time of going to press, his finishing position out of 2561 starters wasn’t known because some were still out there. A bit like training nights at Roman Camp, really. North Norfolk Beach Runners have been busy over the past week in which, out of four races, they had two overall winners and, in one event, no less than five category winners. The big clutch of gongs came at Coltishall Jaguars’ Sundowner 5k on Wednesday where, in a field of 511 including 26 Beach Runners, the first among the firsts and overall race winner, despite his advancing years, was usual suspect Neil Adams (M 40-44) in 16.50. Not far behind, in 14th place but 1st in category, was Tony Witmond (M 50-54) in 18.32. 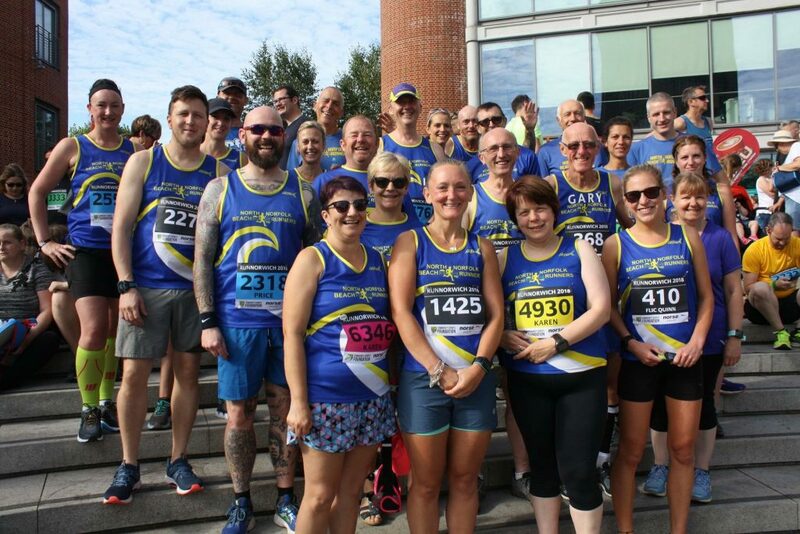 Next among the category firsts and fresh from setting a record at Run Norwich last week, was new-kid-on-the-seniority-block, Sam Weller (M 70-74) in 22.08, followed in the NNBR scheme of things by Karen Balcombe (F55-59) in 22.15 for 123rd and again 1st in category. The last of the firsts was Liz Letzer (F 70+) in 33.58, but there were category podiums also for Louise Pegg (F50-54) in 22.42 for 2nd; Caroline Dickens, (F35-39) in 21.30 for 3rd and Rachel Robson (F 55-59) 25.26 also for 3rd. 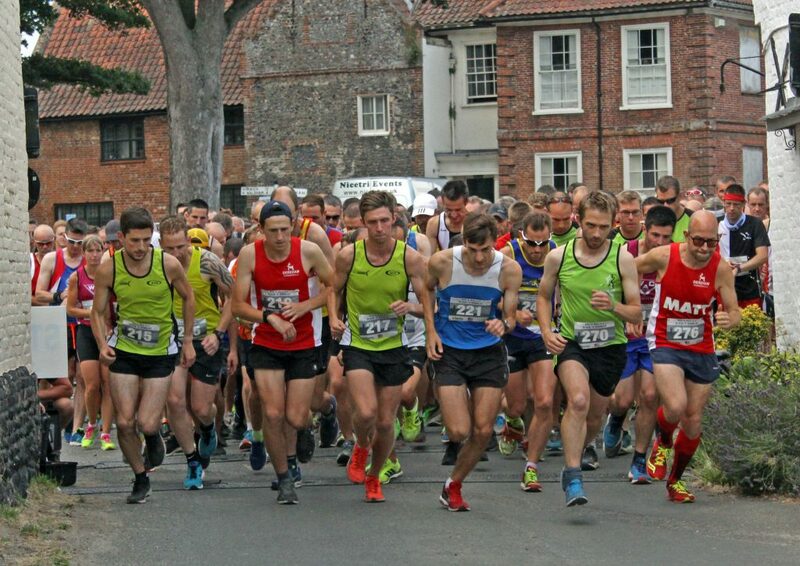 Meanwhile at the Reepham 10k on Friday, where NNBR fielded 18 runners among 349 starters, the overall winner was again a Beach Runner, Finlay, Swanson (MO), who only recently joined NNBR senior ranks from North Norfolk Harriers, and ran 35.20. Other notable performances came in the M70+ category where Sam Weller, seemingly getting the hang of this ageing business, ran 46.45 for 75th overall but 1st again in category, followed by Jim Hayes (M70+a few) in 50.24 for 126th and 2nd in category. Adrian Dyde (M60-69) in 45.16 completed the category gong count with 3rd, which, for those two races, gave NNBR a dozen podiums in total, second only to Russia. At the Great Yarmouth half marathon by contrast, NNBR had nine runners among 380 finishers, but no-one did much to report about. Do try to keep up, folks. NNBR did nevertheless have one notable outlier in Beck Maun (F40-49) who opted for the Stour Valley Path 50K and, in a field of 126 finishers, clocked 5.37.16 for a very creditable 23rd overall. Two score North Norfolk Beach Runners were among 5509 finishers in the Run Norwich 10k, run around the streets of the eponymous city on a hot Sunday morning. In a race won by Nick Earl (M16-39) of City of Norwich Athletic Club in 30.49, the first Beach Runner home was Neil Adams (M40-44) in 36.40 for 24th overall and 4th in category, followed in the NNBR scheme of things by Dean Howard (M45-49) in 42.41 for 205th overall and 18th in category. First lady Beach Runner was Lisa Oakley (F40-44) in 49.39 for 717th overall and 18th in category. Other stand-out performances came, as is increasingly usual of late, from the mature end of the membership, with Adrian Dyde (M60-64) in 47.14, for 567th overall but 6th in category; Gary Linder (M60-64) in 47.32 for 526th overall and 5th; Mike Marshall (M70 plus seven) in 1.09.05 for 4145th and 16th; and the recently qualified SuperSeventy, Sam Weller (M70 but only just) in 47.05 but 1st out of 26 in category. It’s all downhill from here, Sam. Stairway to heaven – a NNBR covey in the pre-race zone, self-effacing Sam Weller 7th from left at the back. Eight North Norfolk Beach Runners were among 450 who ran the Worstead 5-mile on Friday 27th July. It would have been more but NNBR were marshalling the event and most of the membership were tabard-clad and scattered around the lanes of the hinterland. In a temperature close to 30C, the race, which forms part of the Worstead Festival, was won by Dominic Blake of Reepham Runners in 27.06, with the first Beach Runner home, Chris Parker (SM), claiming 10th place in 29.46. The other Beach Runners were: Adam Smart (SM), 24th in 31.25; Dean Howard (MV45) 63rd, 33.52; Kathryn Head (FV35) 156th, 39,52; Phil King (MV60) 193rd, 41.18; Jen Armstrong, (FV40) 188th, 41.46; Kat Sanders, (FS) 230th, 44.26; and Club President, SuperSeventy and all round good egg, Noel Spruce (MV70+) 303rd , 50.42. Reephams Team 1 were the winners in 45.36, Team 2 were 4th in 49.52, Team 3 were 7th in 54.11, Team 4 were 3rd in 48.49 & Team 5 were 10th in 57.35.